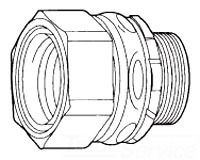 Crouse-Hinds Liquidator™ Non-insulated straight liquidtight connector with threaded connection, has a trade size of 5-inches and outside diameter of 6.063-inches. It has a thread length of 1-7/16-inches. The 4.563-Inch connector supports a wire size ranging from 6-AWG to 250-MCM. Connector in zinc electroplated finish, has malleable iron construction for durability. It withstands a temperature ranging from -40 to 85 deg C. It is suitable for use with liquidtight conduit. It is ideal for wet locations and suitable for machine tool manufacturers, electric power generating plants, waste treatment facilities, paint manufacturing facilities, automobile manufacturing facilities, aerospace industries, breweries, food processing plants, dairies, pulp and paper mills, petroleum refineries, chemical and petrochemical plants. Connector meets UL 467/514B, cUL C22.2, CSA, NEC: Class I, Division 2, Class II, Divisions 1 & 2, Class III, Divisions 1 & 2 standards.